Yesterday I chucked my small backpack with all my outdoor radio gear into my Ford Super Duty 4×4 truck and headed to Boston, Massachusetts. 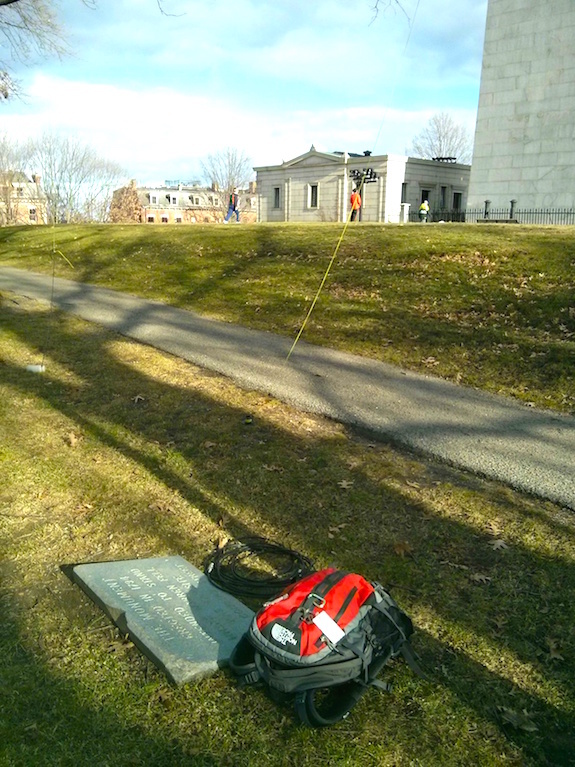 I also had stowed my BioennoPower power pack, my portable aluminum mast and its support and other miscellaneous gear. While loading up I had no idea what the day would bring. However, as the sun was setting and I was talking with a few operators 3,000 miles away in Oregon and California with barely enough power to light up two tiny night lights, I realized I had unknowingly advanced my amateur radio skills by ten years in just ten months. My goal was to set up my radio at five different National Park properties and have conversations with at least ten other radio operators from each of these locations in and around Boston. 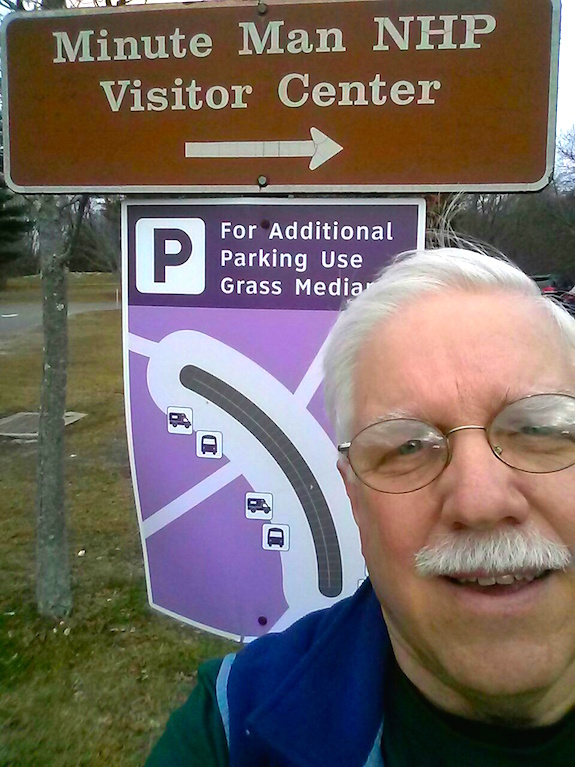 With only four days left in the year-long National Parks on the Air (NPOTA) event sponsored by the American Radio Relay League (ARRL), I was running out of time. I had wanted to do this radio day on December 30, 2016, but a frightening weather forecast motivated me to advance my plans. A major Nor’easter was climbing its way up the East Coast and had its sights set on New England. Yesterday was perhaps the only day anyone was going to comfortably do outdoor radio in New England for the remainder of 2016! It was an aggressive goal with only about ten hours of daylight and I had already wasted one hour of it before even jumping in my truck for the two-hour 100-mile-plus drive down to Mordor from my home in central New Hampshire. That’s what my family calls the greater Boston area because the traffic is so insane compared to tranquil central New Hampshire. 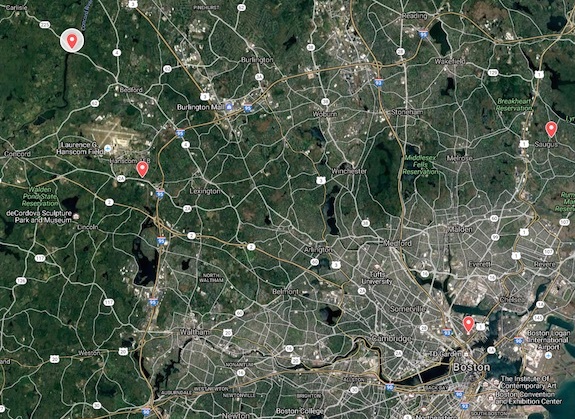 The sites I had selected were scattered all about the greater Boston area with one of them right in the shadows of the giant RF-emitting skyscrapers of downtown Boston. I decided to use my trusty Elecraft KX3 transceiver for my radio. It has a self-contained antenna tuner that allows me to transmit on any frequency between 80 and 6 meters when I connect my 29-foot wire antenna to it. A simple 9:1 unun at the end of the antenna wire allows tames the resistance on the wire so the Elecraft tuner can do its magic. When I write down, or log, contacts with other operators I use just simple paper and a pen. I don’t want to rely on electronics in the field for important activations like this when many other operators are counting on me to record our conversations. Electronics can malfunction and with no paper backup you have no idea who you talked to. Each operator who contacts me gets a point for each of the units I operate from. It’s all for bragging rights. Many thousands of radio operators across the USA, Canada and the world are participating is this event and value each and every park unit they can put in their own log books. I decided to activate this unit first for a number of reasons. It was the furthest from downtown Boston and just off Route 3. If you look at the above map I think you’d agree it made the best sense to start here and travel southeast into the maw of Boston then head north to end up at Saugus Iron Works and catch the Lamprey River site on the way back home. Google Maps came in quite handy when I went to scout a location for this site. 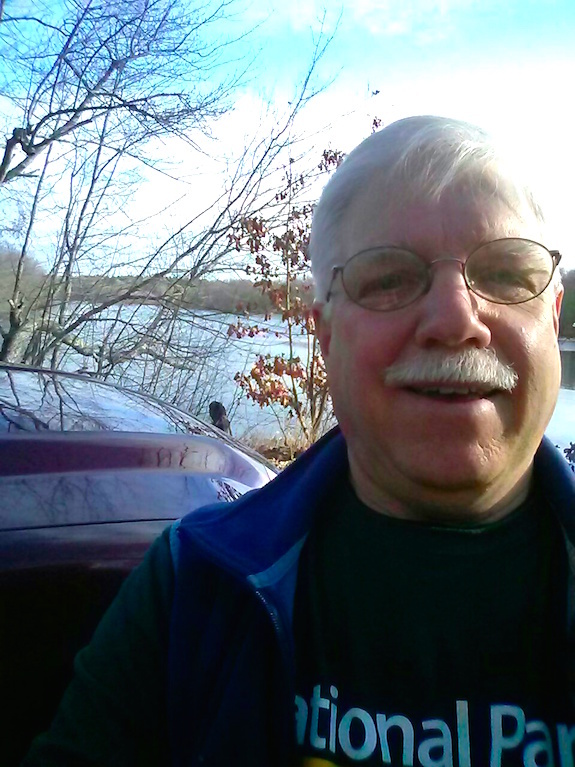 I found a wonderful small gravel road that ended immediately next to the Concord River. It only took a few minutes to get my antenna up into an overhanging tree. I was stunned that the ground was bare. 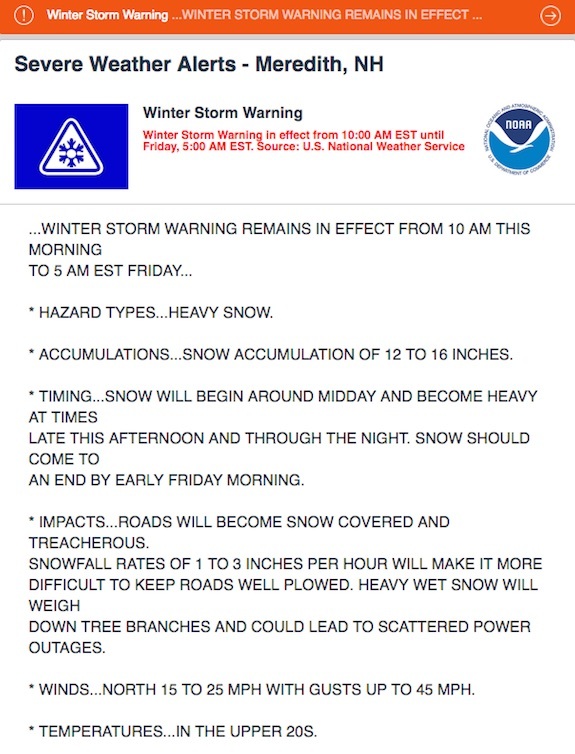 Just two hours before I left 14 inches of snow in my yard. My plan was to get the minimum required ten contacts, or QSOs as we call them, and then pack up to move to the next site. Ordinarily I might stick around a single location for several hours working as many contacts as possible on as many bands in both Morse code and voice. We call using our voice on the radio phone or single side band in the hobby. I started using Morse code and within sixteen minutes I hit my minimum of ten contacts. I made two additional contacts just for good keeping. The timing was good as no one else was calling for me. It was time to pack up and head a few miles away to where the shot heard round the world was taken. It only took about fifteen minutes at the most to get from the Concord River site to the parking lot of the Minute Man Visitor Center. The center was closed for the winter, but there were quite a few people who were at the park walking along the old road where the colonists engaged and then chased the British soldiers back to Boston harbor. There was a magnificent oak tree next to the parking lot that accepted the first throw of my water bottle. It soared up about 40 feet into the bare branches and came straight down to the ground. I decided to start with a longer-range frequency, twenty meters, to give some of the chaser operators a chance at contacting me. It worked well as my minimal 10-watt signal was reaching Alabama, Wisconsin, Texas, Indiana, Mississippi and a host of other states with no issues. Here at Minute Man I did a combination of voice and Morse code collecting fourteen total contacts in twenty-eight minutes. While this may seem like a large number, it’s not. Some NPOTA activators gather hundreds of contacts in a couple of hours. My last contact was at five minutes before noon. I was hungry as hours ago before leaving home I had just one very tiny delicious pumpkin muffin Kathy, my wife, made the day after Christmas. It was time to pack up and head to Bunker Hill. I grabbed a bite to eat along the way. 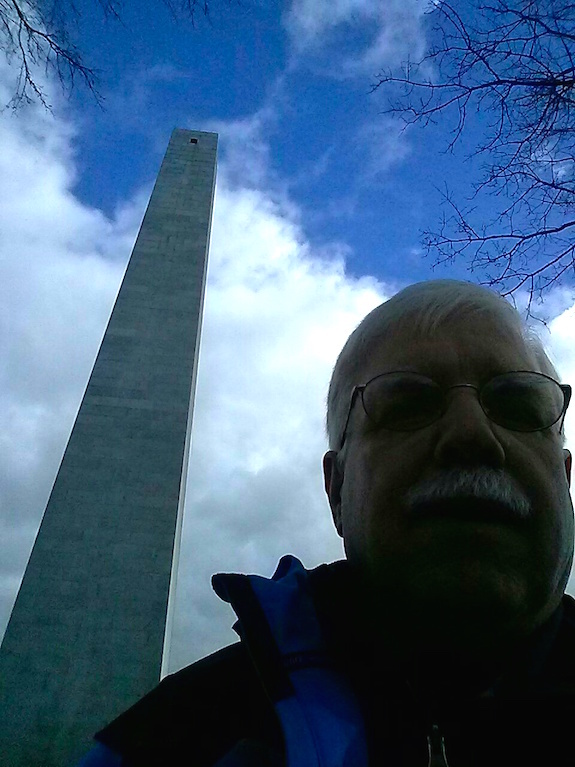 Several years ago I visited Bunker Hill for the first time. I only had a few minutes and that was going to be no different today. All one has to do is go there and you’d see why General George Washington chose it as a location to set up his cannons to terrorize the British fleet in the harbor below. I’m told his men set up on the wrong hill as there was a better one adjacent to Bunker Hill. But I could be very wrong about this. It was partly sunny by the time I found a parking spot and walked up to the grassy area surrounding the towering monument. I had a bad feeling about this location. It’s surrounded by millions of people and using things that create radio interference. When you have a giant antenna, a powerful transmitter and other accessories at your home you can overcome this issue. I had a small radio that put out a maximum of 15 watts and a thin wire antenna dangling from a tree. Lady Luck dealt me a winning hand. I only operated for twenty minutes and got the minimum ten contacts. I was desperate to get more, but they were not to be had. I was also getting cold as the sun had gone behind some clouds and the wind was picking up. It was time to move on to Saugus Iron Works. Little did I know but the fun was about to start. It only took about 30 minutes to claw my way through traffic to get to this very interesting national treasure. This unassuming spot was the center of the iron production for the colonies one hundred years before the Revolutionary War! Think about that for a second. That’s as much time spread as between now and the start of World War One! By 1670, the blast furnace at this site had gone cold forever. The small parking lot had perfect tall trees to accept my wire antenna. It took me two throws to get the exact branch so I’d have a nice vertical wire hanging next to my truck. It was just before 3 pm before I was set up and ready to transmit. The sun was low in the sky. Now was a perfect time to use a long-range frequency and voice mode to help other operators put this relatively rare park unit into their log books. Remember, the NPOTA event ends in just four days! Once I got on the air, I had to untangle a decent pileup. That’s the name for what happens when many operators try to make contact with just one operator as he transmits in a somewhat rare location. 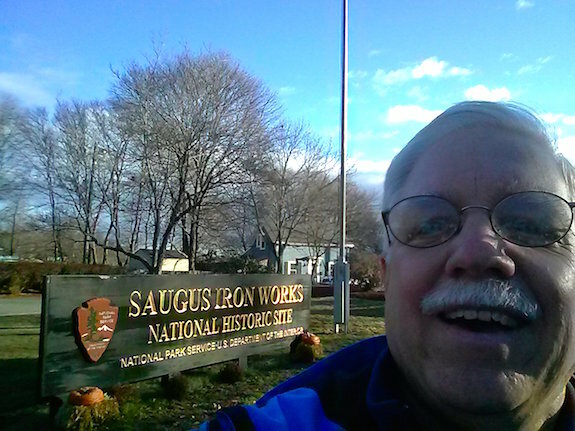 It turns out many needed Saugus Iron Works and it’s quite possible it would be the last time it would be activated. As I worked my way through the pileup more than one operator thanked me and told me this was a new park unit for them. They were polite and happy. I remember clearly looking through the windshield at the sun as it sank lower in the sky. For a few brief moments I thought about how this was going to be my last NPOTA activation. I knew that there was no way I was going to make it to the Lamprey River before it got dark. I had no intention of getting home after 8 p.m. and since I activated the Lamprey River twice in the past two months, I wasn’t unhappy about not going there. In just fifty-two minutes I made forty-two contacts at Saugus Iron Works. I was elated! I had made more contacts at other NPOTA sites back in the summer, but this last one was more fulfilling because of the feedback I received from the other operators thanking me. Just before 4 p.m. I was packed up and ready to leave. As I was winding up my antenna, I thought about how the NPOTA event had transformed me. Many thoughts were swirling through my head, all of them good ones. I decided that I’d sleep on it and do a separate story about how this spectacular NPOTA event coupled with a tiny radio, a battery no bigger than a box of band-aids and a tiny wire antenna brought me, and I believe thousands of others, more pleasure than one could ever imagine. Thanks to the ARRL staff that made it possible!